Traveling is not an endless joyride of euphoria. Instead, there are times when you get tired of moving around. I had one of those phases, but then Thailand brought back my travel spirit. When you focus on the small details, it’s easy to skip parts of the big picture. While I’ve been writing about all the countries I’ve visited, I haven’t talked so much about the mental side of travel. And truth be told, I was a bit tired of traveling for some time. Instead of dealing with the feeling, I just tried to ignore my worries. That didn’t work out. Luckily, I got my traveling mood back during my trip to Thailand, and I believe I learned my lesson. 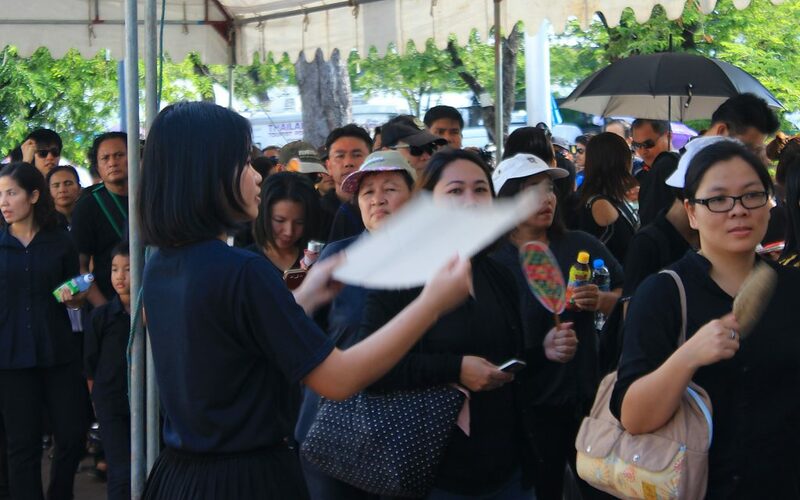 Mourners of the king march to the Grand Palace in Bangkok. 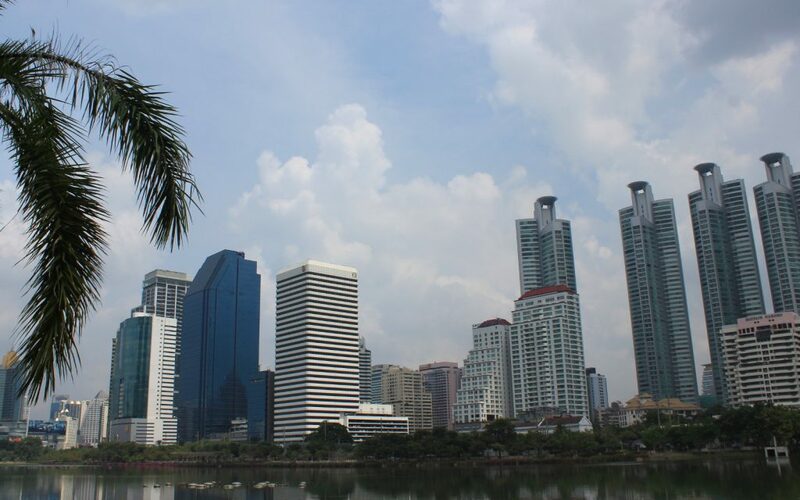 My first impression of Bangkok was vital. I was expecting another Delhi or Dhaka – a poor and overcrowded Asian capital with dirt and trash everywhere. Instead, I was welcomed by a surprisingly urban metropolis with skyscrapers, Skytrains and recognizable international brands. I really liked Bangkok. It was just what I needed at that point. The public transport made moving around easy, the supermarkets were well-supplied and there were many good restaurants available. Most importantly, Bangkok has plenty of beautiful parks. As I sat on a park bench away from the traffic, I felt relaxed. The Bangkok I wasn’t expecting. 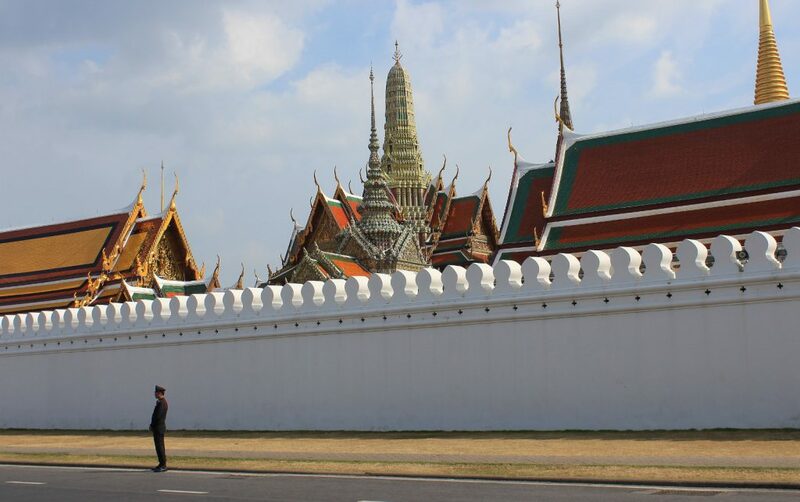 A lone guard standing outside the Grand Palace. I also happened to arrive in Bangkok during a very special occasion. The King of Thailand had died just a week earlier, aged 88. 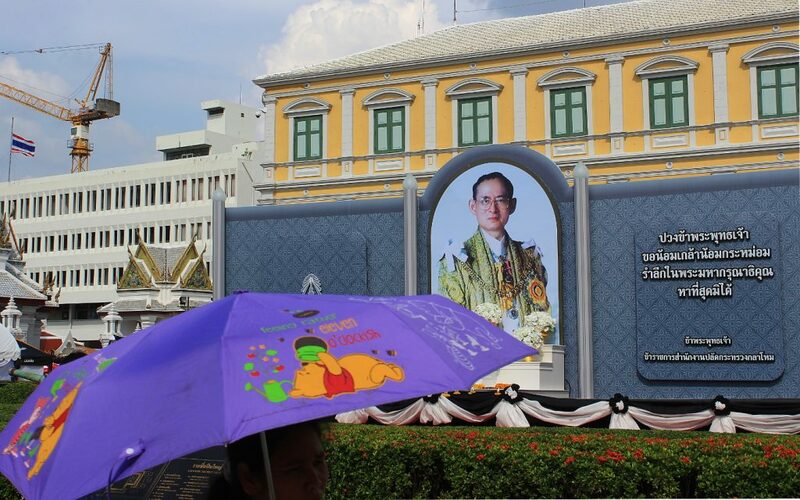 King Bhumibol had ruled Thailand for 70 years. His death was massive news in Thailand, and the effects were impossible to miss. During the 30 day mourning period, all locals wore either black and white. Public areas were full of homages for the late king. Websites, including Google and YouTube, had changed their logos to black and white. And while television programs were not completely colourless, the colors were digitally diminished to suit the national mood. 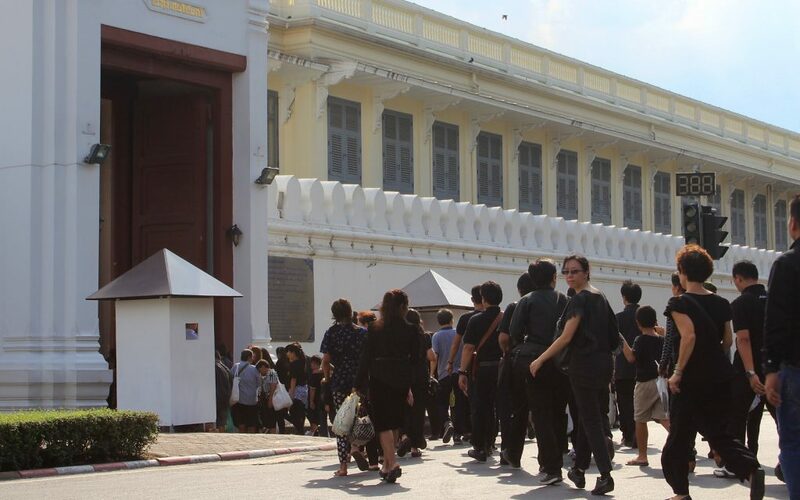 Citizens of Thailand waiting in line to enter the Grand Palace. Workers waved cardboards to help with the heat. While clothes had to be black, the rule didn’t include umbrellas. 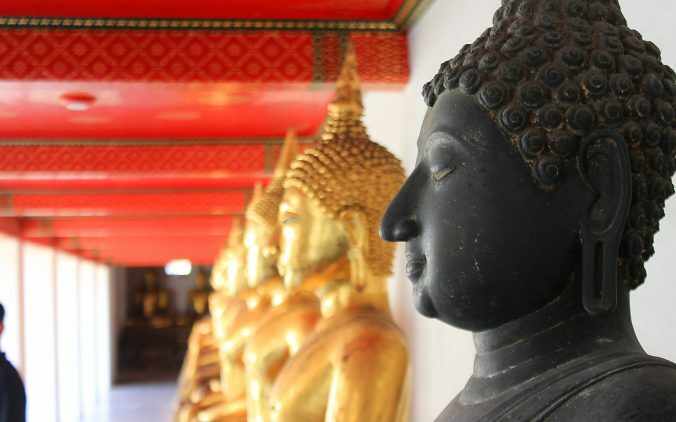 My trip to Thailand happened during a very historical period. The occasion reminded me that such incredible events even exist. Moving around, I got the sense that I was witnessing something completely unique. Although colours disappeared from my surroundings, my traveling mood was brightening up. 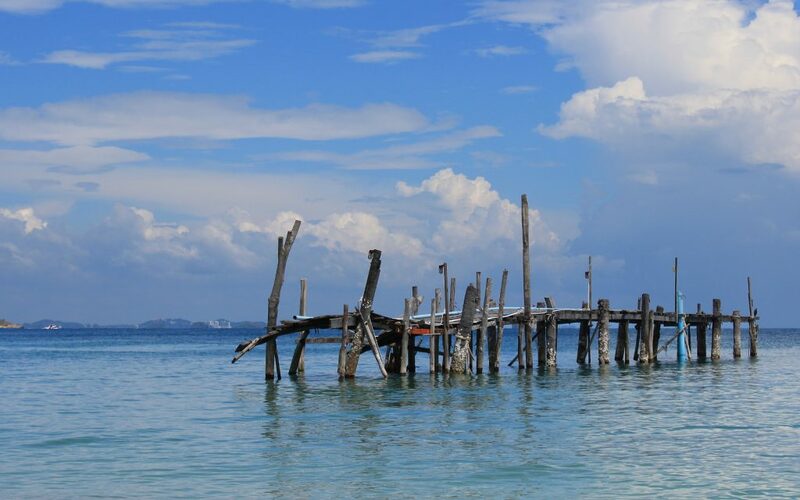 An old dock in Koh Samet. Besides the special occasion I had other great experiences that made me feel happy. 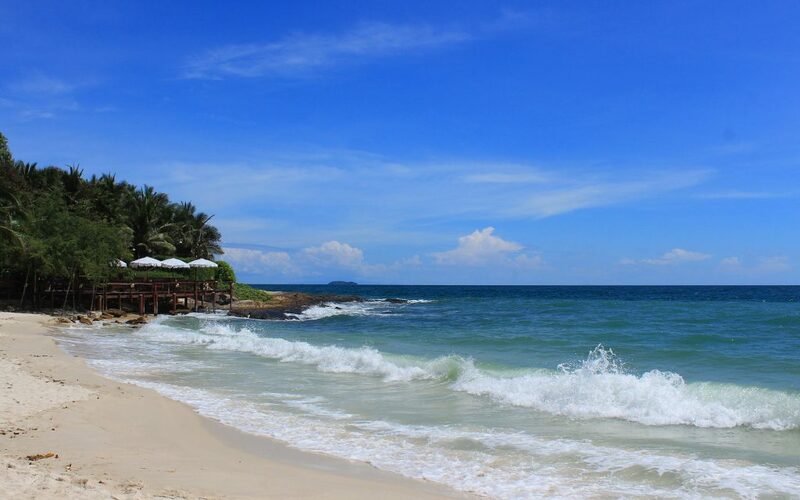 From Bangkok, I went to the island of Koh Samet. While the place is very touristy, it didn’t matter when I found almost empty beaches where I could swim in the ocean. I also stayed with absolutely amazing CouchSurfing hosts in Bangkok during the last two nights of my trip to Thailand. My CouchSurfing host Paul buying fruits from a street vendor. Many beaches to choose from. But why had I grown tired of travel before Thailand? I’ve been thinking about it lately, and there are many reasons for my low traveling mood. Most importantly, I believe I started to crave too much for things that I don’t have right now. Instead of focusing on my trip and current life, I wished for things I could only have once my trip was over. At the same time, I had grown habits that I didn’t really enjoy, but I didn’t do much to change them. I had developed a minor case of the traveler’s blues (for a great blog post about the subject, read “How to Survive a Case of Travellers Blues” from the blog Travelling the World Solo). I felt lonely, overworked and aimless. I wasn’t seriously depressed, but I wasn’t feeling as good as I wanted, either. There’s light at the end of the tunnel. Or an ugly, grinning mermaid statue. Or maybe both. The situation worked as a great wake-up call. Now, I’ve started a sort of a “personal happiness project”. I’m thinking about the things that are bugging me, and I’m working actively to change them for something better. I’m also paying more attention to the positive events in my life. When I’ve stopped to really think about my current life on the road, I’ve come to realize how much I like it. There’s no other place I’d rather be right now. Sorry, that I keep on commenting your posts, but you brought up a topic that is so familiar to me. I also fall into the “blues” on my journeys time to time. To me that’s a sign that I’m in a wrong place. Countries are different as are people and some countries don’t match with your personality. Then it’s time to change environment: more radical the change the better. Simple as that. Sometimes I have got stuck in a place that I don’t feel good. Stuck beacause I have thought things won’t get any better elsewhere or they might get even worse. The day that I have pushed myself on the road again has been the day of joy and freedom. In some countries traveling itself (moving from one place to another) is so exchausting that it has taken its toll. Ethiopia was this kind of country, India worns me out, too, but mainly because of constant noice, big crowds and lack of own space. Travellers often think that they will find peace of mine in a small village etc. But quite often I have found peace in a big city: Bangkok, Mumbai (Colaba to be precise), Lima or in Nairobi. Feeling aimless is also a big issue, Right now I am in guesthouse where most of other white people are what so ever aid workers or volunteers. I am just killing time while waiting for my Burundian visa. I feel as I am useless and traveling vanity. I guess I should make more radical changes of scenery from time to time. I’ve found that my favourite places are neither the biggest cities or the smallest villages, but somewhere in between. I prefer parks and other quiet, peaceful areas, but I also like the easiness of supermarkets, metros and other services in the cities. It’s too bad that many countries demand you to book a return flight before you arrive in the country, so it’s harder to extend (or shorten) your stay. And I agree about being aimless: having a clear goal keeps your life and traveling together. If you’re not sure about your own motivations, it can affect your mood and drain the joy out of many experiences. Return ticket, oh no, you don’t need it! Do a research Näin askartelet feikkilipun and you will my details on how to travel on a fake ticket. Thailand has a special charm. I’m glad it re-sparked your travel mood. It was the first place I ever traveled to and I instantly fell in love. I went about a year before the King died. While I was there I remember one of my favorite parts of the country was how much they loved him. Photos everywhere and taxi drivers saying “do you know the King? His birthday is soon!”, It was so refreshing. 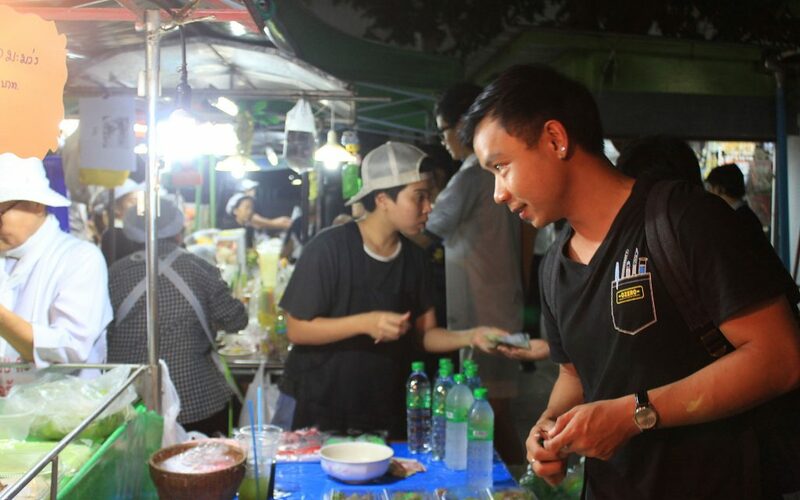 When I heard he died I was devastated, a part of Thailand’s charm would be missing. Very interesting to see that everyone wore black and white. Haha, great! 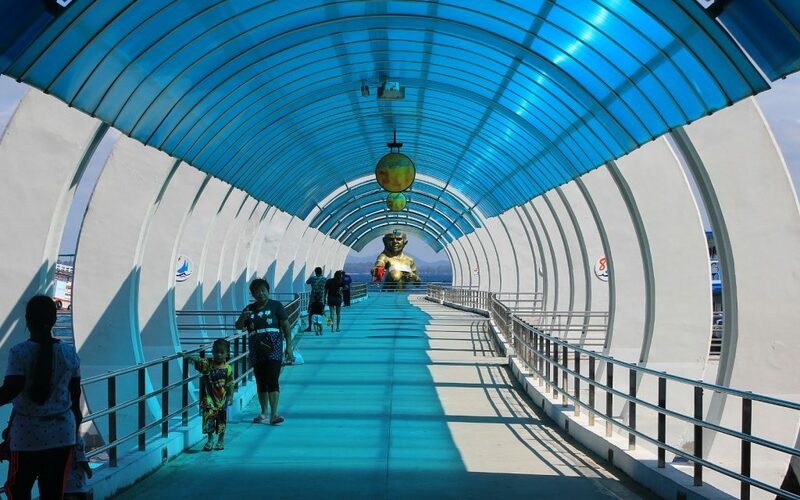 🙂 Thailand is a great first travel destination – it has an interesting and distinct local culture, but international companies and all the tourist services are also very accessible to make traveling easy.